The origin of the Neapolitan Mastiff as a guard of an estate gives it a natural instinct to act as a protector of family. This breed is dedicated to its owners and can be very distrustful of people that it does not know. The Neapolitan Mastiff is highly affectionate with children, but it is important to socialize it at a young age due to its guardian instincts and large size. Since this breed is so large in stature, occasional mishaps may occur when kept inside of the home. Because of its protective personality, it may not do well around other dogs, especially other dominant breeds. The Neapolitan Mastiff does not require a significant amount of physical activity. This breed does need a large area to live in and cannot be kept in small places. It enjoys the opportunity to be outdoors, but not in weather that is warm. The Neapolitan Mastiff is large in size and can cause unintentional mishaps in the home around items that are easily breakable. This breed is also a messy eater and may not be suited for a person that is obsessively clean. 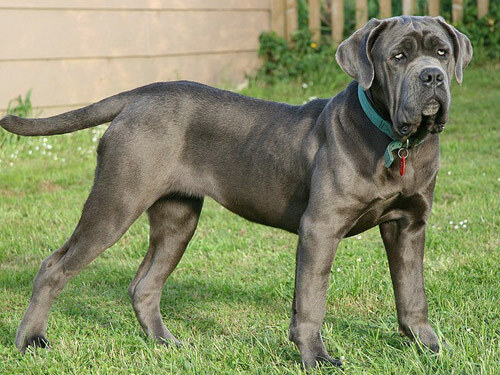 The major health concerns for the Neapolitan Mastiff are CHD (canine hip Dysplasia) and cardiomyopathy. The minor health concerns include cherry eye and elbow Dysplasia. The suggested tests for this breed are tests of the hip, elbow, eyes, and cardiac system. The average life span of a healthy Neapolitan Mastiff is 8 to 10 years with the life span tending to be shorter if the dog is larger. Breeding of this dog often calls for artificial insemination or a caesarean section delivery. Large bodied war breeds that were utilized as guard and battle dogs date back to ancient times. Around the time of 330 B.C., the Molossus breed was developed from a cross between Macedonian war breeds that were transported to the lands that Alexander the Great had taken over and the shorthaired breeds of India. Greece was raided by the Romans who brought over these Molossus dogs and eventually the Romans took these dogs into their invasion of Britain. While in Britain, the Romans came into contact with large British mastiffs that surpassed the battling abilities of the Molossus. The Molossus was crossed with these giant British mastiffs to create a new and fierce warrior dog called the Mastini. The Mastini made its way into other countries as well and started to find a place as an estate guardian over the next centuries. The Mastini, which is Italian for mastiff, did not have a wide following until it was spotted in 1946 at a dog show in Naples. A man by the man of Piere Scanziani noticed the dog and began the crusade to develop a standard and eventually earned the breed recognition with the name Mastino Napoletano, or Neapolitan Mastiff. The Neapolitan Mastiff was not documented as having entered the United States until sometime during the 1970’s, however it is possible that it arrived earlier than that with Italian immigrants. The AKC approved an initial standard in 1996 and in 2004 the Neapolitan Mastiff became a part of the AKC Working Group.